As a follower of a seasonal diet I usually find myself incredibly bored by the time February comes around. It's been a long couple months of root vegetables, followed by more root vegetables, followed by...well, you get the point. And then citrus season arrives, just in time to brighten up my day! The best winter citrus fruits go way beyond normal lemons and oranges, so let's take a look at what you might find at the farmer's market. Once you have your bounty, you can enjoy some of the best recipes the season has to offer. I'm definitely making some citrus sangria, boozy citrus mojito popsicles, and other amazing citrus cocktails to cure the winter blues! Blood oranges (also called the Moro Orange) will show up in December and hang out until around May. These smallish fruits have an orange rind that is sometimes covered with little red flecks. Their brilliant red flesh gives the orange it's gory name, but don't be afraid. Their aftertaste is slightly more bitter than regular oranges but they're also much less acidic and have a slightly fruitier flavor. Pick out the oranges that feel a little bit heavy for their size - this one usually is the juiciest one of the bunch. These pink-fleshed oranges, also called Cara Cara navel oranges, are anything but ordinary. They have less acidity than the normal naval orange and a sweeter flavor. They are very reminiscent of tart berries (think cranberries or blackberries). As a bonus, these oranges are seedless! Use these beauties anywhere you would normally use oranges between December and April. 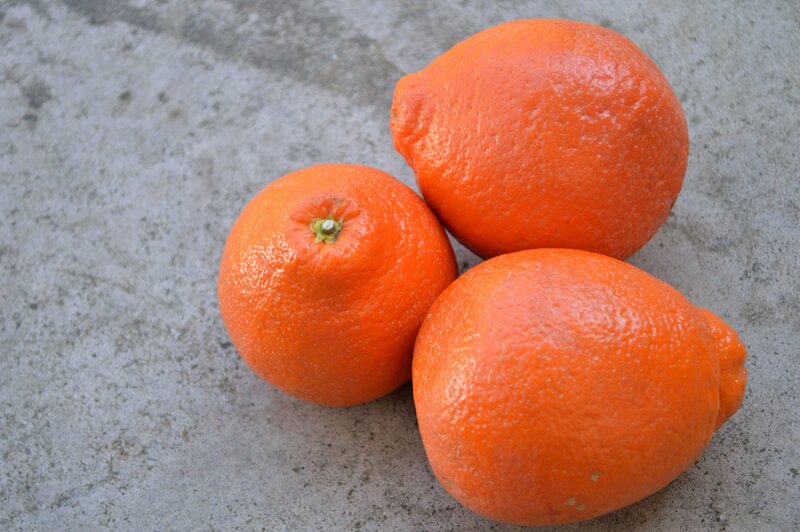 Unlike the seedy tangerine, the clementine is seedless and a just as easy to peel. Its sweet flavor makes the clementine one of the most popular snacking foods in the United States. Unfortunately for clementine loves, the season is unusually short - November to January - so snack on these sweet treats while you can. These thin-skinned lemons are difficult to transport, giving them a much heftier price tag than normal lemons. Are they worth it? Absolutely! This orange-lemon hybrid has all the tang of a regular lemon but with a much sweeter aftertaste. The sweetness of this lemon zest makes these lemons super popular for preserving, but they're also incredible in a cold citrus salad or for making lemon bars. Expect to see Meyer lemons from early November through late March. Pink grapefruits are available all year round, but the juiciest and sweetest grapefruit come from Texas and California. The season there is a little bit shorter - look for them to start arriving around January and hang out until early summer. The pink varieties are slightly more nutritious than the white grapefruit, making them some of my favorite winter citrus. The pomelo is the largest fruit in the citrus family and the rind definitely reflects that fact. It might take a little work to get through that thick rind but once you reach the flesh it's totally worth it. Its flavor is similar to a grapefruit but without any of the bitterness. They might be yellow or green on the outside, and the inside ranges from a pinkish- to a whitish-hue. The season for these large fruits begins in the fall and runs through early May. If you're not quite sure if you want a tangerine or a grapefruit, reach for this sweet-tart treat. They're super easy to peel, making them a perfect snack between September and late December. They peek early, though, so you might not see them in the later winter months. If you missed tangelo season, reach for a tangerine instead. Their season is much longer - from November to late March - and they pack a super sweet punch. They have an orange-forward flavor, but their smaller size concentrates that flavor into a sweeter package. Their thin skin makes them easy to peel and their segments easily come apart.